1. What first sparked your interest in crystals? I’ve been attracted by crystals since I was very small. My grandparents lived in the English Lake District and I spent a lot of time walking there with my grandfather picking up ‘shiny things.’ I amassed a wonderful collection of Quartzes. Later I found a rather strange mineral shop in Southend and bought masses of crystals from him. However, he wouldn’t identify anything so, when I found there was no crystal directory available, I ended up writing The Crystal Bible to record my experiences with them. Things snowballed from there. 2. What’s your favorite thing about working with crystals? I love to work intuitively with them so that they can reveal themselves to me. I’ve been an astrologer for fifty years and always placed crystals on birthcharts when doing karmic readings to balance out the energies. This expanded into sharing them with workshop participants. Now I spend a great deal of time talking to crystal skulls and crystal dragons. It takes me into the multidimensional multiverse, a great place to explore. 3. You’re written so many books about the world of crystals, what sets your latest book, “The Crystal Seer” apart from the others? (Judy Hall refrained from answering this question, so allow me to insert a little info/review here.) 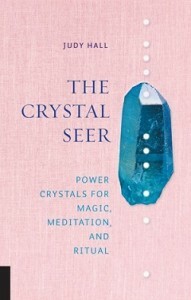 “The Crystal Seer” features content from Hall’s previous release “101 Power Crystals”. It is compact, full color 176 pages of beautiful photos and of course loads of info about crystals! It is a sturdy hardcover that will travel well in purses and messenger bags for crystal identification on the go. It’s good stuff! 4. These days you’ll find crystals in everything from skincare to bottled water. Do you find this further infusion of crystals into items beyond jewelry a good thing? Crystals have always been in the most surprising of places, even the sparkplugs in your car and the paint on your walls. So this expansion doesn’t surprise me. But, as I believe that there is no such thing as ‘one crystal fits all’ I do feel you need to find the right product for you in order to gain benefit. 5. What’s one of your favorite crystals, and why? The one crystal I wouldn’t be without is a Brandenberg Amethyst. It literally does everything I could ever require of it – and more. From all over the place! I still go out and pick them up from a very special crystal mountain – and any beach I happen to be on. I also buy from trusted websites, wholesalers, rock shows, favourite stores. I’m fortunate in that I’m often sent new crystals to assess. There are some lovely crystal suppliers out there. 7. If someone wants to start using crystals, where do you think they should begin? 8. What do you do when you’re not working with, or writing about, crystals? I visit sacred sites, which are one of my great passions, although of course that often involves crystals (see my Crystals and Sacred Sites book). Quite often from the comfort of my armchair courtesy of a crystal. I travel as often as possible as I really enjoy seeing new places. I’m just off to see some amazing huge rock balls in Romania that are, allegedly, still growing. Really looking forward to that! I also play as often as possible with my great granddaughter who is four, that’s a great way to take a different view of the world. I devour books and I enjoy splashing paint on canvass to see what occurs. 9. What’s next? Do you have any upcoming projects my readers can look forward to? Yes, my ‘Crystal Companion’ came out on 5th April. This is a book I am really excited about. It brings together information on crystals, introducing many of the latest finds, with how I personally work with them. It’s been colour-themed for the various areas of life in which you can use crystals so if someone works through it they’ll have explored just about every crystal possibility. 10. Parting shot! Ask us at The Magical Buffet any one question? Well, rather than a question, I have a suggestion. How about asking all your subscribers to dedicate a crystal to world peace and hold it for just a minute a day. It could make such a difference at this troubled time. Judy Hall (Dorset, England) is a successful Mind-Body-Spirit author with over 45 MBS books to her credit including the million copy selling “Crystal Bible (volumes 1 and 2)”, “Encyclopedia of Crystals”, “101 Power Crystals”, “Crystals and Sacred Sites”, “The Crystal Seer”, “Crystal Prescriptions”, and “The Crystal Wisdom Healing Oracle”. A trained healer and counselor, Judy has been psychic all her life and has a wide experience of many systems of divination and natural healing methods. Judy has a B.Ed in Religious Studies with an extensive knowledge of world religions and mythology and an M.A. in Cultural Astronomy and Astrology at Bath Spa University. Her expertise are past life readings and regression; soul healing, reincarnation, astrology and psychology, divination and crystal lore. Judy has appeared four times in the Watkins list of the 100 most influential spiritual living writers and was voted the 2014 Kindred Spirit MBS personality of the year. An internationally known author, psychic, and healer, Judy conducts workshops in her native England and internationally. Her books have been translated into sixteen languages. You can learn more about her and her work at her website.